Marcho & Blanco - Hobbits have been around since the First Age. But until about the middle of the Third Age, they had not settled their own communities. 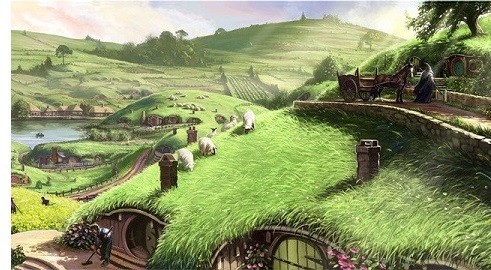 Then in the Third Age, two Hobbits put down roots in Middle Earth and the first Hobbit community sprang up. "For it was in the one thousand six hundred and first year of the Third Age that the Fallohide brothers, Marcho and Blanco set out from Bree; and having obtained permission from the high king of Fornost (Agreleb II), they crossed the brown river Baranduin with a great following of Hobbits. They passed over the Bridge of Stonebows, that had been built in the days of the power of the North Kingdom, and they took all the land beyond to dwell in, between the river and the Far Downs. All that was demanded of them was that they should keep the Great Bridge in repair, and all other bridges and roads, speed the king's messengers, and acknowledge his lordship.